Figure 1. Professor William E. Dibble, Physics. Photo by Bradley Slade. With an abundance of enthusiastic demonstration and discovery, a multidisciplinary megacourse satisfies all the general-education science requirements but only whets the curiosity of eager students. It’s 2:53 on a Friday afternoon, and in a basement classroom in the MARB, R. Paul Evans, ’95, assistant professor of molecular biology, is winding down a discussion of genetics. For the uninitiated, his language would seem opaque, as though he were zig-zagging between English and some other language full of long, Latin-flavored words. Figure 2. 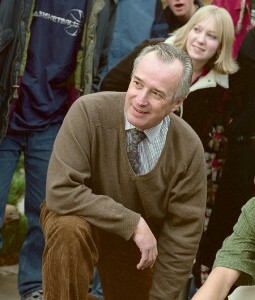 Professor C. Wilfred Griggs, Archaeology and Ancient Science. Photo by Bradley Slade. For their part, the students—nearly all of them nonscience majors—seem to handle the linguistic calisthenics with ease. They nod knowingly and say things like, “Oh, that’s so cool.” They don’t even flinch when Evans laces consecutive sentences with the phrases RNA polymerase, ribosome catalyzation, and genetic transcription. You can’t help but feel impressed by the caliber of these students, many just freshmen. They are, after all, involved in one of the most intense general-education courses offered at BYU. The class, officially titled Honors Colloquium in the Sciences, is a nine-credit-hour honors course that spans two full semesters. Figure 3. Professor R. Paul Evans, Molecular Biology. Photo by Bradley Slade. Taught by three BYU professors, one professional geologist, several guest lecturers, and a teaching assistant, the class satisfies the general-education requirements for Physical Science 100, Biology 100, and the natural-science elective. It is a fast-moving and eclectic crash course in astronomy, biology, the history of science, mathematics, philosophy, physics, and religion, and most who take it—freshmen or otherwise—say it provides a perspective-changing experience. What’s more, these students seem genuinely to enjoy the Herculean workload that comes with the course. Case in point: After the bell rings, students encircle Professor Evans and unload question after question, seeking more fuel for their newly kindled curiosity about genetics. According to many students’ watches, the weekend has already begun, yet for more than 10 minutes, Evans is held back by no fewer than 12 still-hungry minds. Hands-on exposure to natural phenomena, like static electricity, energizes student learning and adds an element of fun to Honors Colloquium in the Sciences. Photo by Bradley Slade. Imagine studying with a professor who is an expert in fields as diverse as Renaissance magic and quantum mechanics, cutting-edge genetics and early Greek science, classical languages and contemporary cosmology, geology and mathematics. In effect, students get this amalgamation of scholarship from the instructors who team-teach Colloquium in the Sciences. 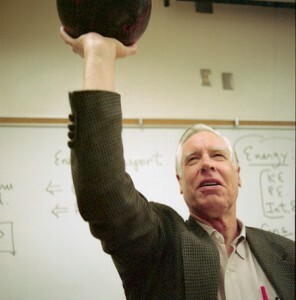 William E. Dibble, professor of physics, has been with the course the longest. For several years he worked with James L. Farmer, now a professor emeritus of integrative biology, developing the course’s pedagogical model, much of which is still used today. Originally, Farmer and Dibble hoped a class that combined two disciplines within one course might provide students with a deeper understanding of the most basic scientific principles and modes of thought. After Farmer retired, Evans eagerly took his place as a course instructor. Around that same time, C. Wilfred Griggs, ’66, an archaeologist and a professor of ancient scripture, and professional geologist Otis H. Willoughby, ’86, also signed on. The result: a course where nearly any scientific issue is fair game and where concepts and discussions are rarely limited to any single disciplinary approach. It’s a course in which students are constantly exposed to competing ideas and radically different scientific theories. In terms of application, this approach means that students might go rock-collecting one day, spend another day among the planets and stars in the planetarium, and find themselves trying to explain mind-twisting physics demonstrations on yet another day. The focus on methods means students can never content themselves with mere memorization or regurgitation of facts. They are instead expected to learn and practice the habits of thought of leading scientists—habits that, when applied, lead to questions, not answers. Genius isn’t necessarily knowing how to find the answer, Dibble explains; genius is knowing how to pose questions that will lead to the right answers. And so, he continues, the multidisciplinary approach of the course provides students with not only the setting to develop strong habits of thought but also a wonderful variety of stimulating scientific problems on which they can practice. As they experiment with science, students gain more than an understanding of principles and substances, like liquid nitrogen. They learn sound reasoning skills and develop their own curiosity. Photo by Bradley Slade. According to the professors of Colloquium in the Sciences, if you have to force students to ask questions, you’ve already lost the game. Instead, the professors strive to put students in situations where their natural curiosity drives them to learn and understand. To do this, Dibble says, you need “a sense of adventure.” So, for example, in this class you won’t simply chart rock strata and theorize about the laws of superimposition. You will bus around central Utah, where you can hike hidden canyons and look out over mountainous vistas, which, for Willoughby and his students, illustrate the points more clearly than any geology textbook ever could. Or, to take another case, you won’t just talk about physical laws, you will see them in action—which, in this class, means seeing Dibble in action. Dibble’s physical demonstrations are the stuff of folklore. On any given day, you’ll find him at the front of the class, an amused grin painted on his face, firing off bolts of static electricity; or launching metal rings from an electromagnet, across the quad, to a student wearing a catcher’s mitt; or choreographing amazing chemical reactions with all the enthusiasm of a child using his first chemistry set. He is as much a performer as he is a teacher. Given that the class is designed primarily for students whose academic fields lie outside the sciences, this talent becomes an invaluable asset. Not to be outdone, Evans also has his ways of keeping students alert and interested. 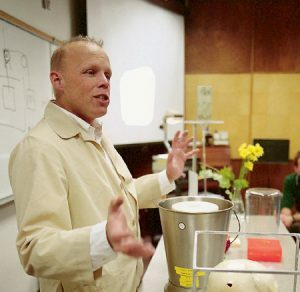 During a demonstration with liquid nitrogen, for example, Evans will slip a hot dog into his glove in place of his forefinger. After freezing and shattering a racquetball and a flower, he suddenly dips his finger into the liquid, puts it down on the table, and brings down the hammer. The hot-dog finger and glove shatter, and students scream. Evans laughs diabolically and holds up his hand; slowly, his still-intact finger squirms out of the ragged tear in the glove. If they do nothing else, these in-class performances serve one key function: they help students remember that science can be both an adventure and a discipline, that teachers can be both intelligent and personable, and that learning can be a whole lot of fun. The team of professors brings to the course an array of scientific instruments and a wide spread of expertise. They also offer students a love for science and a fascination for the world around them. Photo by Bradley Slade. Of course, the fun and learning are not always planned. In Colloquium in the Sciences, opportunities to learn and apply class concepts can be found anywhere—even in mishaps like the one that occurred on a geology field trip to Utah’s San Rafael Swell in 2000. The tour bus dropped the students and professors at a trailhead near a hidden canyon several miles from the nearest paved road and about 45 miles from the nearest town. Willoughby then led the students on a geology hike up the canyon, indicating the different strata of rock, asking students to offer theories on the conditions that caused their formations, and pointing out that they were, quite literally, walking through millions of years of natural history. The students even spent some time studying, with Professor Griggs’ help, several Anasazi rock paintings on a sandstone wall. Eventually, after testing several hypotheses about how best to move the bus and learning from the failures, the group came to a viable solution. They’d already discovered that the tires couldn’t grip the flat shale stone, so with a pile of pebbles ready, they began to rock the bus back and forth, the motion opening gaps between the tires and the surrounding sand, which then allowed them to pour the pebbles in around the tires. With each push back and forth and each new pebble dropped beneath the wheels, they raised the bus, inch by inch, up to surface level. Using a scientific model of experimentation, sound reasoning, and a pile of pebbles, they were able to raise a several-ton bus out of nearly a foot and a half of sand and get it back on the road again. Though they didn’t know it at the time, the students that day passed Evans’ most important test: without any help from the professors, they’d approached a difficult real-world challenge using the scientific skills learned and modeled in class. And, just as importantly, they did it with the confidence that, if they posed the right questions, eventually they’d solve the problem. Three days after Evans’ lecture on genetics, the students return to class full of questions and eager to begin work on a project dealing with glow-in-the-dark bacteria. When Evans reminds the students of an upcoming exam, no one complains. Instead, they spend a few moments coordinating out-of-class study groups and donations for pizza delivery. In a typical year a few of the students may switch their majors to the sciences. Others search the bookstore and the library for more information on scientific areas of interest. Nearly all of them recommend the course to roommates and friends. It is just as the professors of Colloquium in the Sciences hope it will be. Nathan Chai is an English graduate student and a former BYU Magazine intern.